Can you conquer stage fright by changing point of view? Or are the physical sensations of nervousness always going to get to you in the end? This is my story of how I came to realise that between physical sensations and thought patterns, thought patterns are the more destructive agent when it comes to performance anxiety. So why didn’t I go? How did I end up where I am today? I couldn’t cope with the nerves. Particularly before solos, my heart would race, my hands and knees would shake, my blood would pump so loudly in my ears that I could barely hear. But worse than that were the fears of getting things wrong, of disappointing people. I spent much of my time before every performance in the grip of a forecast of doom. I was convinced that my performance had to be note perfect, and that anything less was a failure. I quit. There’s only so long that anyone can take that sort of pressure. At that time, in that place, I couldn’t conquer stage fright. It conquered me. When I say I quit, I need to be more precise. I quit music. I didn’t quit performing. When I went to university, in addition to all the sensible courses, I enrolled in Theatre Studies for a bit of fun. It became my passion. I loved the academic approach to theatre, but if I’m honest, I loved the acting and directing the most. And I never suffered stage fright. In fact, I didn’t really experience negative nervousness at all. Not once. Did I feel my heart go faster before I went onstage? Yup. If anything, it went even faster. I can remember waiting backstage before one performance and wondering what the fastest heartrate recorded might be, as I thought mine at that moment probably rivalled it! Did my hands and my knees shake? Yes. Definitely yes. When I was in Samuel Beckett’s Play, in which the three actors are encased in urns, mine could be seen vibrating! But it never bothered me. I was having too much fun. Now I look back and I can see that, logically, there is little difference between standing in front of an audience wearing a fake beard and carrying a sword, to standing in front of an audience with a recorder mouthpiece between my lips. But at the time, the rules and stories I told myself about each activity were very different. So if you want to conquer stage fright, have you considered whether your ideas and attitudes about the activity of performing might be a significant part of your difficulties? Is there a similar activity that causes you no problems at all? What is the rule that makes the difference? And it isn’t just stage fright that can be helped by looking at hidden rules and preconceptions. Go hunting, and you may be surprised what ideas you have that rule the way you operate/behave in everyday activities. Yes, we can conquer stage fright. And sometimes looking at how we think is the first step on the path. * The Netherlands is one of the major centres of recorder teaching, and early music in general. ** FM Alexander, Constructive Conscious Control of the Individual in the IRDEAT complete edition, p.294. *** FM Alexander, Man’s Supreme Inheritance in the IRDEAT edition, p.123. 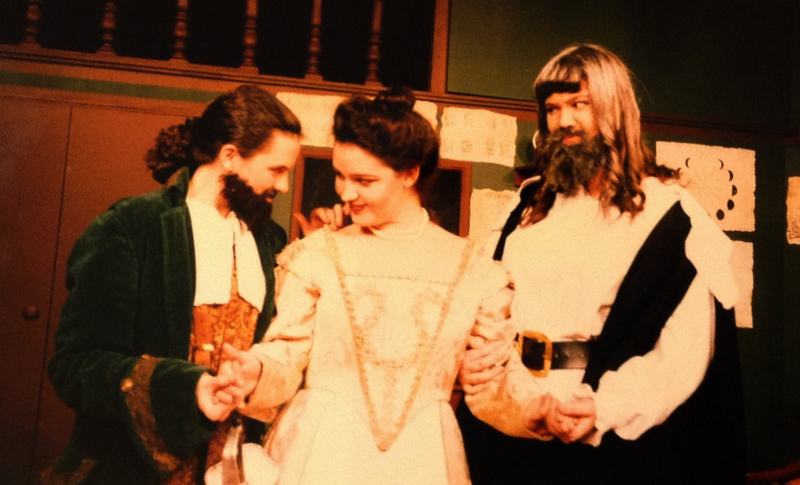 Photo of Jen in a fake beard as Face in Ben Jonson’s The Alchemist, 1993. Photo by Rex Bunn.